Lib politicians continue to raise taxes on gas since they have been able to get away with it for so long. I heard on the news that they now want to start taxing batteries, tires, etc. I guess that is in addition to our normal 8.75% sales tax. The liberals running the state just can't stop raising taxes. If they can think of a stupid idea they will pass legislation to tax it. 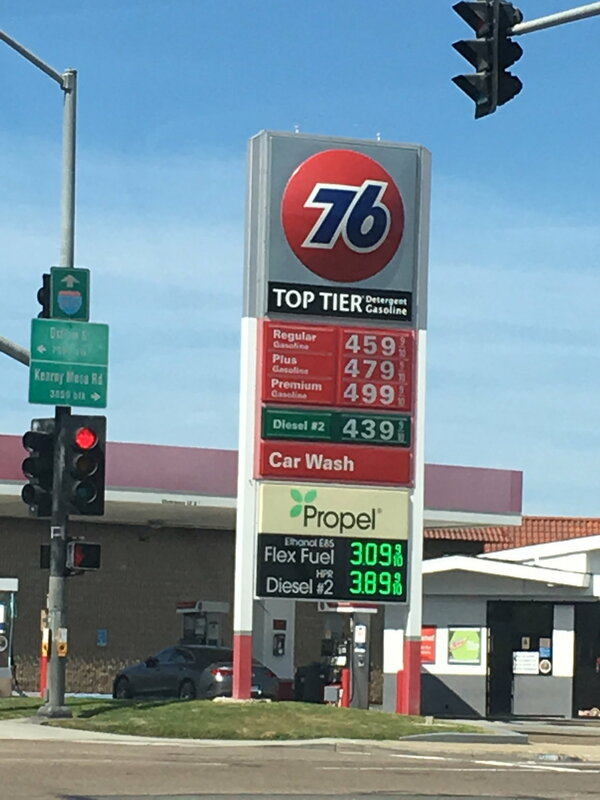 What suprises me is gas by my Orange County place is $3.99 for regular, and $4.27 for premium. Ouch!!! And yesterday I bitched filling up the Civic for $2.42 a gallon. For $5.00/gallon, every fill up should come with a tube of KY jelly. I filled up this morning (premium) $4.29 per gallon. They will tax anything that they believe that they can get away with just to pay for all of the illegal aliens in our state. If you run across Kenny the journalist in your town, make sure to mention that Danville is MAGA country. CA is in competition with NJ now to see who can tax gasoline the most to support a Liberal/Socialist agenda. how much of that is CA taxes... 60%? 70%? Cal tax+.35cents per gallon.....Fed 18.4 cents per gallon. And that'll be an additional $24.99 + tax of course. Any liberal state should put a 150% tax on liberal politicians income. the secret to econoical living is to locastee within walking distasnce to the public transportation grid outside of the muncipality or county that operates it. Near a transfer hub is the best ! evensenior suburbanistas are now ditching their cars en mass by age 68 and using uber and pub trans. Ironically, NJ used to be on the lower end of the scale - for full serve, no less. It's not all taxes. I was in SoCal not long ago buying premium at ARCO for about 3.29/gallon. Either a gouge by oil companies or local dealers. Filled up at my local 76 this morning. Usually we're not that far off California....but happy to see we're quite a bit off in this case.